The stuff legends are made from! The Boyd Coddington name is synonymous with one thing – custom hot rods. Years of experience both building and enjoying classic cars and custom hot rods taught Boyd which products work best on painted finishes. He passed this information on to his son Boyd Coddington Jr, who developed the Boyd Coddington Detail Garage Product line. Featuring products that range from interior care to wheel and paint coatings, Boyd Coddington Detail Garage Products are a line of quality, long-lasting, and valuable formulas. Body Coddington Detail Garage Products started out as just one product – Boyd’s Ultra Violet. This was their first venture into quality car care products, and a lot has changed in the 25 years since Ultra Violet’s release. Each Boyd Coddington Detail Garage Product stands for the highest quality and outstanding performance you would expect from such a prestigious name. 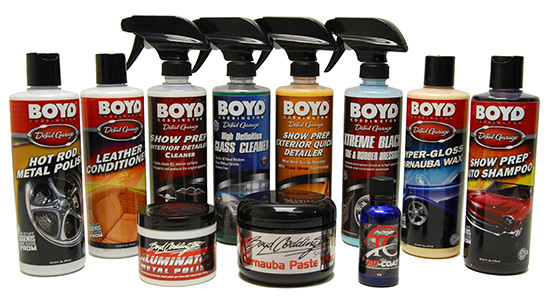 All Boyd Coddington products are made in the USA using the latest innovations in surface care. In fact, many of them were designed using feedback by the original detailers that had the pleasure of detailing the custom Boyd Built hot rods for years. The attention to detail used in production of Boyd Coddington Detail Garage Products won’t disappoint!